Recent changes in government property taxation, stamp duty and income tax have undeniably sent out mixed messages as to the government’s view of buy-to-let landlords. On the one hand, they continue to postulate on their commitment to a healthy PRS (Private Rented Sector) confirming what a vital role the sector provides and acknowledging the desperate shortage of affordable accommodation. On the other hand, the legislative tax realities and other disincentives introduced over the last year has done all to discourage, penalise and deter buy-to-let landlords. The Scottish Government (always keen to outshine Westminster) have augmented these deterrents with their own extra taxes and changes within the Housing (Scotland) Act 2016 that obstruct landlords’ access to their property investments. This comes into force on the 1st December 2017. Succinctly, the government views Scottish landlords as indispensably undesirable. But many heads are still buried in the sand. Buyers have not made themselves fully aware of the latest legislation. This is evidenced by the continuing demand for buy-to-let property. Governments have been equally beguiled by this continued demand. In Scotland, the government is failing to appreciate the fear factor engendered in the new legislation that will put off further investment in the PRS or push that investment southwards or sideways into short term holiday letting. Combined, these changes have made buy-to-let an increasingly unattractive prospect. The government’s theory behind deterring landlords being that it will free up stock for first time buyers. The underlying reason for extra stamp duty was, most likely, as a (sensible) instrument to cool down an overheating property market. But the politicians have stymied themselves by adopting a left wing bias on it that they will find hard to politically undo when attempting to take the chill off the sector. This is already evidenced in the higher priced homes not coming up for sale and the ripple effect that move down the price scale. The problem is, first time buyers are still struggling to buy. Mortgages are more difficult to acquire than ever, over longer terms. The Halifax recently reported a sharp rise in first time buyers opting for a 25+ year mortgage, meaning that they will still be paying off interest practically right up until retirement. Forecasts have shown that property prices in Edinburgh are due to increase by a whopping 23% over the next four years. A lack of new residential property being built in the city centre is a key factor in this price increase, and that isn’t set to change any time soon. The question must be asked – who will be buying property in Edinburgh? First time buyers? Can’t achieve or afford the mortgage. Buy to let landlords? Taxed too heavily to warrant the investment. Who does that leave? Larger property investment companies (who will surely be more considerate landlords than buy-to-let investors? ), or empty nesters looking to downsize (one of the only categories of cash buyers looking to buy for personal use). We’re not saying all landlords are perfect. Property is their business. As a product, property is a very emotional one. We’re talking about home. Where the heart is. For tenants, it’s their life. For landlords, it is their living. Different priorities will result in different viewpoints. Our experience at Factotum is that the majority of landlords are very considerate towards their tenants. They are honest people who are in the fortunate position to own property. Some have inherited it, others have invested in property as a pension, some work abroad or some have built a business around property letting. And now, their livelihood is under scrutiny. 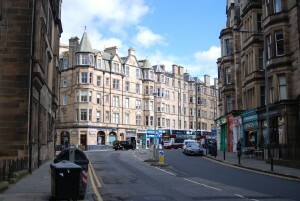 Buy-to-let landlords are a vital cog in the Edinburgh property market. Granted, their presence does create more competition for first time buyers, but without them we risk damaging the property market. Let’s not scare them away.